Found this recipe in an email from Kraft Foods. -BEAT first 5 ingredients in large bowl with mixer on low speed until moistened. (Batter will be thick.) Beat on medium speed 2 min. Spoon into 24 paper-lined muffin cups. -BAKE 21 to 24 min. or until toothpick inserted in centers comes out clean. Cool in pans 10 min. ; remove to wire racks. Cool completely. -BEAT cream cheese, butter and juice with mixer until well blended. Gradually add sugar, beating on low speed after each addition until well blended. Spread onto cupcakes. Sounds yummy! I may have to try these. Love your blog and sounds like you guys had a blast at Creative Estates! Those sound soooo good. I've got coffee to go with them! 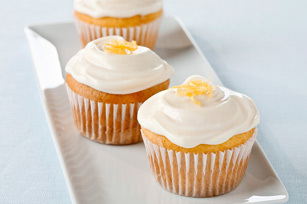 Why yes, I DO love lemon cupcakes!! I have some lemon pudding in my pantry that I was wondering what in the world to do with. These will be perfect. I love Kraft foods - simple recipes and oh so good. Thanks for sharing. Yummy! So good. Looks really delicious. :) Thanks for sharing. What a CUTE and HAPPY blog you have! Popped over from Gina's blog! Love reading about your FUN time at Creative Estates! These look and sound wonderful. Thanks for sharing! How good do these look! I love baking jello and pudding flavors into cakes. Delicious! tempting...they look like they would be SO tasty yummy delicious! I gave these cupcakes a go yesterday. I thought I had some lemon pudding on hand but didn't so I ended up using a lemon cake mix and vanilla pudding. The frosting with the lemon juice added a great lemon flavor too. Thanks for sharing.